1 of 5 Bring a large pot of water to a boil. 2 of 5 In a large nonstick skillet, heat 2 tablespoons of the oil over medium-high heat; add garlic and cook 1 minute until golden. Add broccoli rabe, salt and red pepper flakes; stir-fry 4 to 5 minutes or until tender. 3 of 5 Cook gnocchi following package directions, about 2 minutes. Drain, reserving 1/2 cup cooking liquid. 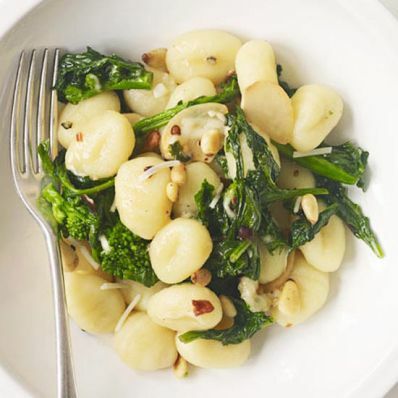 4 of 5 In a large serving bowl, combine gnocchi and broccoli rabe. Add some of the reserved pasta water to create a sauce and sprinkle with pine nuts and cheese. 5 of 5 Drizzle remaining tablespoon oil over top and serve immediately. Per Serving: 12 g pro., 47 g carb., 16 g Fat, total, 10 mg chol., 4 g sat. fat, 2 g fiber, 757 mg sodium, 375 kcal cal.